Simon Crofts was born in Edinburgh, Scotland, which is where he now lives once again after many years away. He studied at Magdalen College, Oxford University, and worked as a lawyer in Moscow when Russia was just emerging from the Soviet Union. 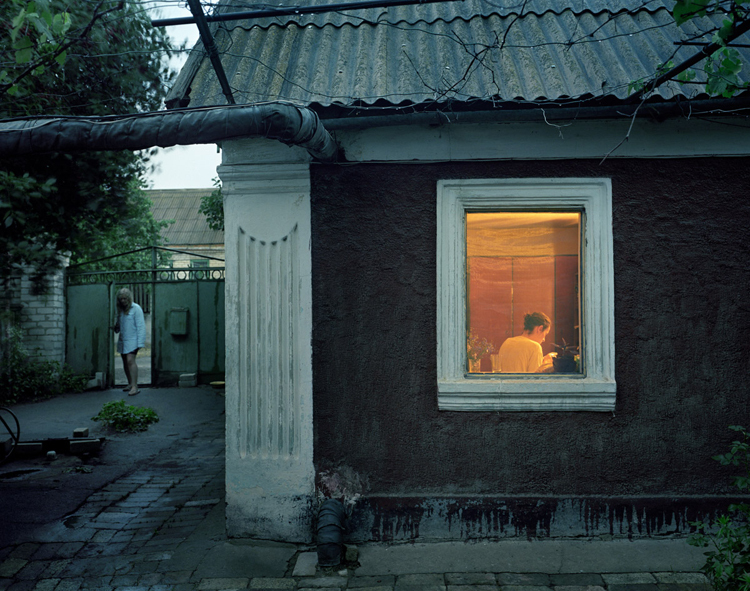 In 2001 he started working as a photographer and moved to live in Poland, in Krakow. 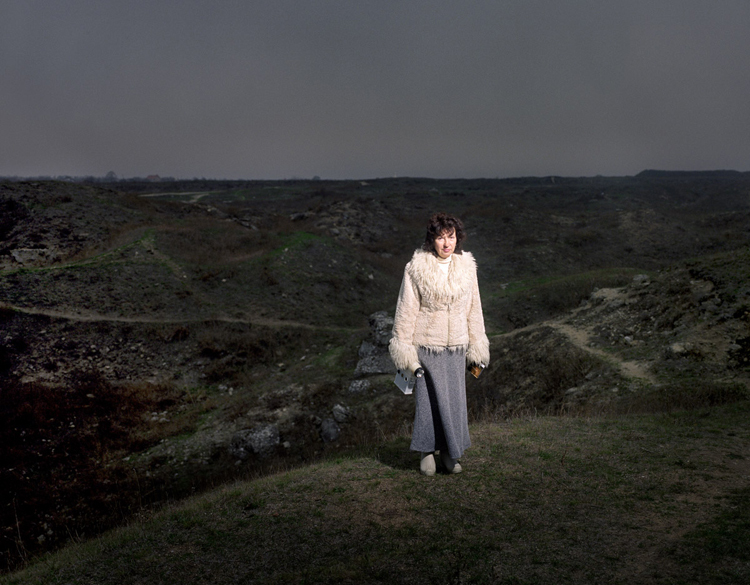 His wife, Sylwia Kowalczyk, is a Polish photographer and the two cooperate closely in their work. 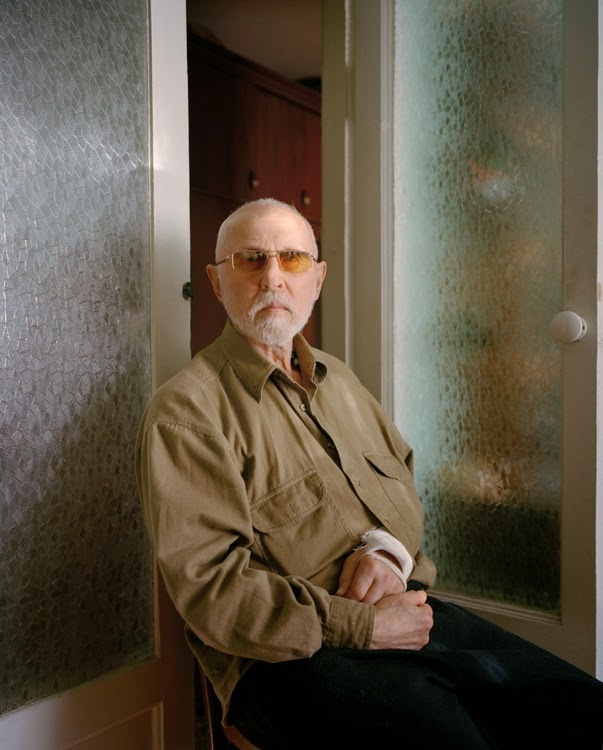 Most of Simon's work has been in Eastern Europe, including a series of pictures about the Russian ballet tradition, but he is also working on a project about paganism in contemporary Scotland. 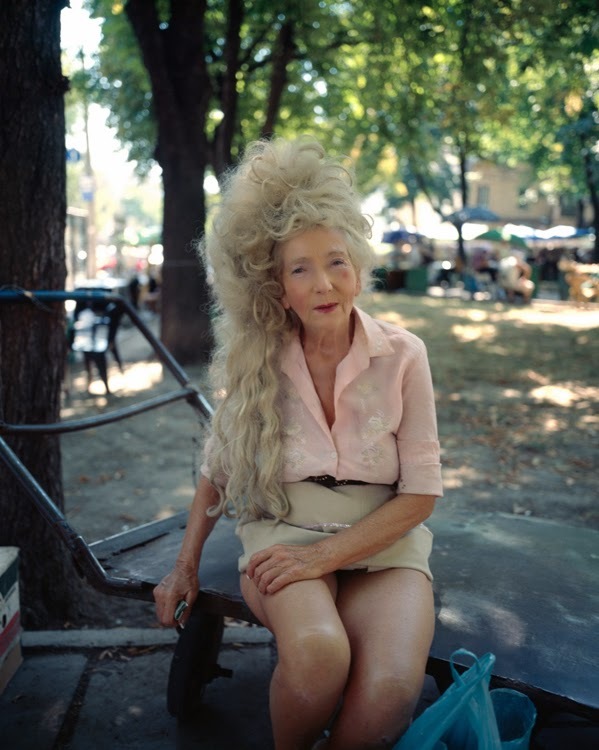 In the Land of Endless Expectations is due to be published as a book by Kehrer Verlag. 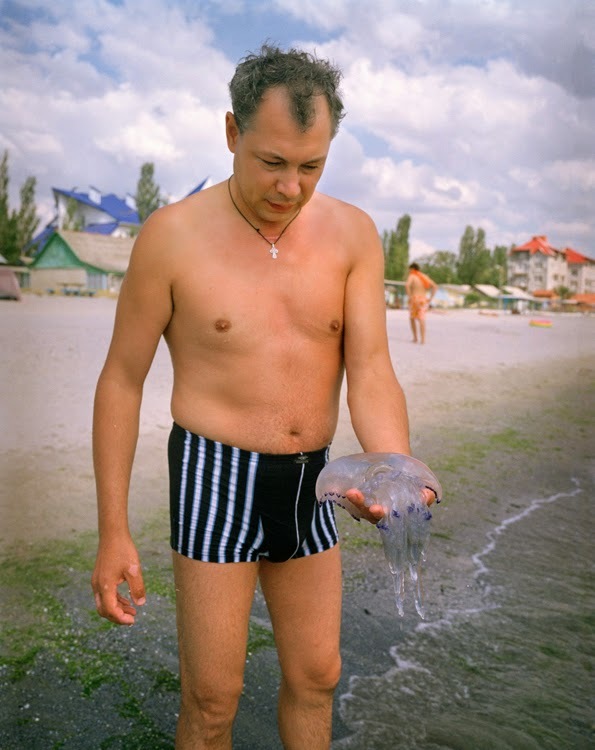 fototazo: You worked for many years as a lawyer and lived in Russia and Poland for extended times, how do those experiences inform your work? Where and why along the line did you pick up photography? Simon Crofts: Russia, Ukraine and Poland were what I was really interested in, being a lawyer was a vehicle for getting access to the region at an exciting time when the Soviet Union had just broken up. I moved to Moscow because I was into Russian music and literature. When I was working in London, I would spend my time on the Tube to and from work learning Russian. My job was the best thing I could have done to see what was happening in a way that few other people could. It meant taking part in some extraordinary events - the first big privatisations in Russia, helping to advise on huge oil, gas and diamond projects, trying to set up the first cooperation with the West in the space industry, and so on. Those experiences definitely informed my photography work. I don't think you can really understand what's happening in Russia or Ukraine now (and that's what this project is all about) without properly understanding what happened in the '90's. And I was right in the middle of it. After a year or two in Moscow, I decided that what was going on around me needed recording, so I bought a camera and started carrying it in my coat pocket and taking some pictures in my lunch break. That was at first mostly in black and white, partly because that was all the material that I could source then - and I set up a makeshift Soviet enlarger and developing arrangement over my bath. At some point, the photography became much more important to me than the day job. 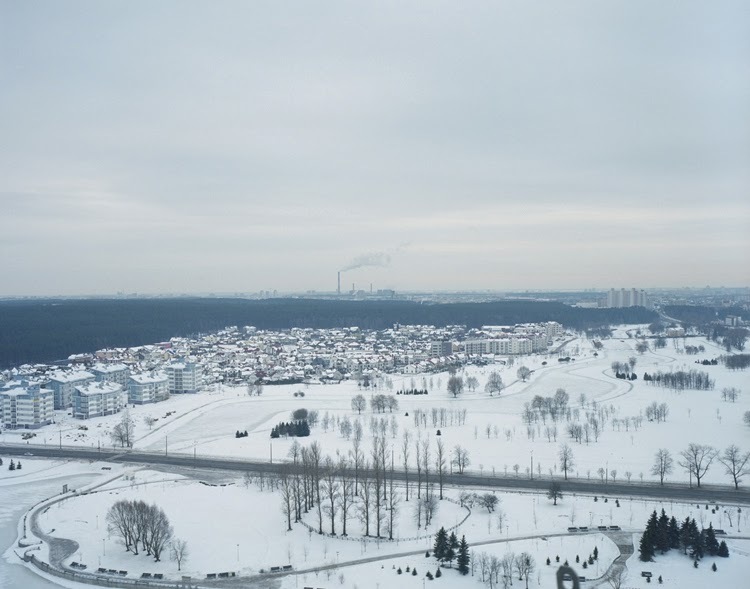 By the time I moved to Poland I had already left law and was working as a photographer - and my wife, Sylwia Kowalczyk, is Polish and also a photographer. The more I learned about this Russian-Ukrainian-Polish rainbow, and saw the differences in perspectives, the more interesting that aspect became. Ukraine is right in the middle (despite its name meaning "borderland") and fascinating for that. But I was interested in the different historical perspectives - especially about the Great Patriotic War, but also subtle forms of national consciousness formed by literature and earlier peoples - the echoes of Scythians, Sarmatians (and the Polish szlachta) (even though it is arguable whether the Sarmatians actually existed), Cossacks, Tartars, Rusity and so on - geo-political divisions can really be traced to different idealised versions of the past. 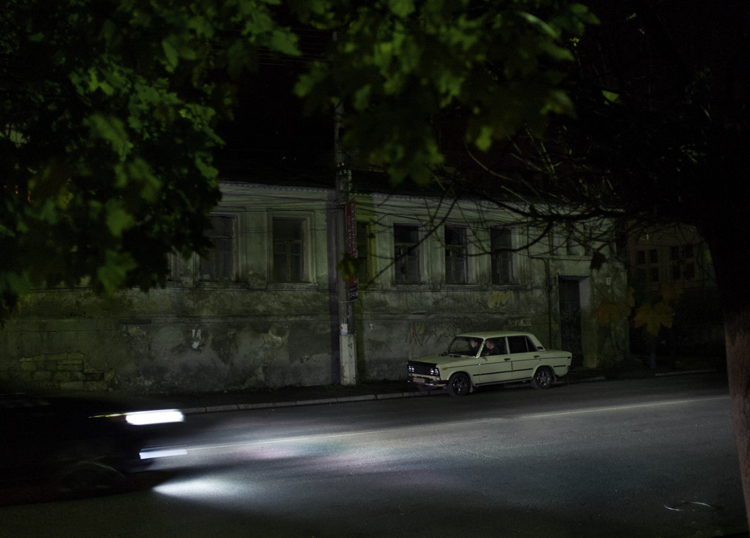 You can see it in the current problems between Russia and Ukraine, which constantly refer to Bandera, World War II, the ethnic make up and history of Crimea, the relations between Tartars and Cossacks and so on – so this look at culture and history is not about the past – it's about what is going on today. I'm interested on how this plays out on an individual level now - experiences, and personal relationships - rather than documenting international politics directly. f: How does In the Land of Endless Expectations compare to your past work in terms of themes and working methods? SC: It's a development of the same issues, because that is my life. The images from the Expectations project were mostly taken in the last couple of years or so, since I returned to living in Scotland. Coming back I think gave me some time to reflect on, to absorb, what had happened - while I was in Russia and later Poland I think I was too close to absorb it. 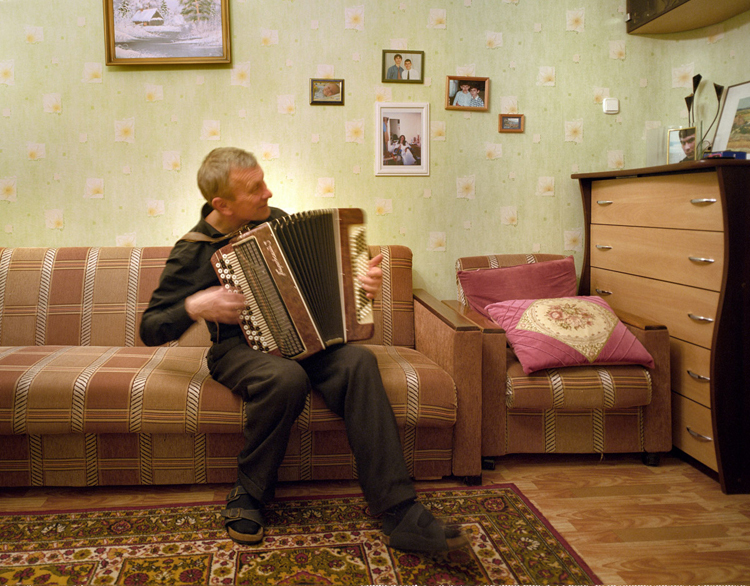 So I paid several visits back to Ukraine and Russia and Belarus to take pictures for the Expectations project after I had finished living there. But I developed my working methods in the sense that I started not just taking pictures but making notes, interviewing people, and making audio recordings, which I hadn't done before. I've also been taking a parallel series of photos about the Russian ballet tradition which overlaps with Expectations - because what I am interested in is not so much people doing pirouettes, amazing though that is, but the fact that ballet is an important part of Russian culture and the people who do it are fascinating. So I see these different works going on in parallel. I don't want each series to be an insulated intellectual exercise with strict rules, it's all about what I want to talk about and therefore they have to connect. The same goes for my series of "tourist" photographs about rooms I stayed in called Room with a View. When I go on holiday, I can't force myself to take a picture of local landmarks like a normal person, the part of each city as a tourist I feel the most connection to is the hotel room I stay in. It's maybe connected to Expectations in the sense that it also involves East-West cultural/societal observations. f: When you talk about being more interested in how ideas from literature, history and the '90s play out on an individual level than being interested in international politics per se, I wonder how you have been able to keep the politics and the macrodynamics of the region in the background while keeping the focus on the individual life, perhaps especially with the current events going on in the region. How have you worked in your writing and photography to establish the balance you want between the individual and their various contexts - artistic, historic, political, etc - in which they live? Has it been hard to maintain those lines? SC: Obviously what is going on in Ukraine at the moment is incredibly important, and I'm following events biting my nails. There are plenty of photographers specialising in conflicts and news who will go and document what is happening on Maidan or in Crimea far better than I could. Attempting to tie Expectations to a specific current event no matter how important (in fact, especially if it is important) could overwhelm the message of what I am really interested in talking about. But I think if a viewer is really prepared to engage with the Expectations project, then they'll start to understand much better what is going on between Russia and Ukraine. If more of this was understood, maybe some of these crises might even not happen in the first place. For a start, people in the West simply haven't paid enough attention to Ukraine up to now. One thing I really don't like is our obsession with celebrity, and the fact that we only seem to be interested in something if it can be tied to a 50th anniversary or similar "hook." It frustrates me that we only seem to become interested in Ukraine if it is invaded by Russia. I mentioned Nadezhda Mandelstam quite a bit in my project, and to me this little old lady who made herself invisible was a far greater and more interesting figure than Stalin. Stalin was a crook who happened to be in the wrong place at the wrong time, and doesn't really deserve our attention except to know about the problems and tragedies that he caused and why. The almost unknown people who appear in my pictures are more worthy of attention than someone like Putin. One of my picture poems (not posted yet) is "The Secret Fear of a Knock on the Door" (which is a line from [Yevgeny] Yevtushenko's poem "Fears"). The accompanying essays explore power, and the manipulation of people using rules. [Dmitry] Medvedev is a lawyer, I worked with him for a while when he was just out of University in St Petersburg - and the Putin/Medvedev double act very much relies on bureaucracy, the exploitation of legal loopholes. "Fortune" I think is obviously connected to the current turmoil. So is "Utopia" - what aspirations are, even why Crimea has such a critical place in the Russian consciousness. But perhaps most of all, I hope it brings people from the regions involved in the events closer to us. In Chekhov short stories the situations are always complex, there is no absolute good and bad, no clean resolutions. Just tangled emotions, motives, consequences – but there is a clarity of vision and understanding. The more we understand of this, the more that we sense the people involved in these events are real, that we can relate to them as individuals that we have a close connection with, the better. That goes not only for Ukrainians, but also for Russians. To have some kind of sense of the Gogol-ian bureaucracy, the psychological effect of the landscape, the historical reasons why many Russians want "a strong Tsar," the sense of national identity and the appeal of a Dostoyevskian sense of being special, and of course what people's aspirations are (Expectations) - all these things help to get a feeling for what is happening in Crimea and Ukraine now and why Putin acts as he does and many Russians support him. It may not solve the situation, but it helps to connect with it. 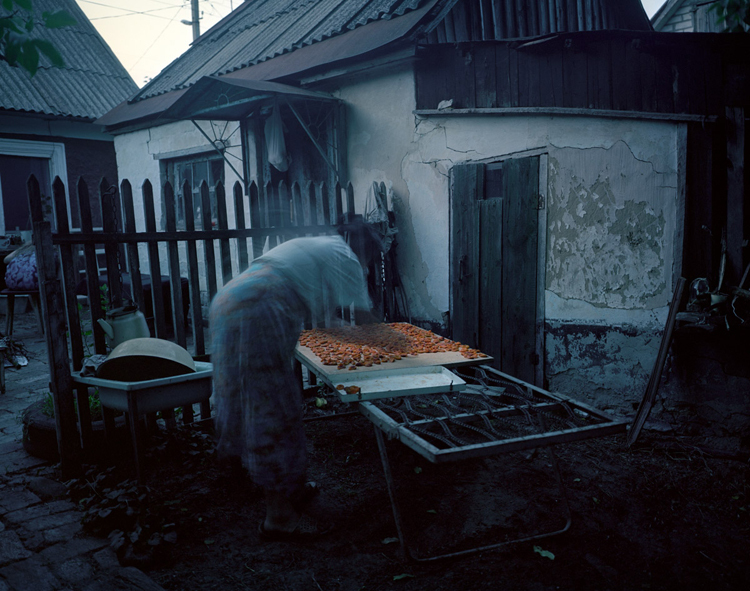 f: Your project involves not only photographs but stories and is a large-scale, six-part project. With so many years lived in the region and a lot of potential source material in terms of stories, gained knowledge of the region and familiar people and areas you may have considered returning to photograph, how did you begin to organize the project and how did you arrive at its overarching structure? 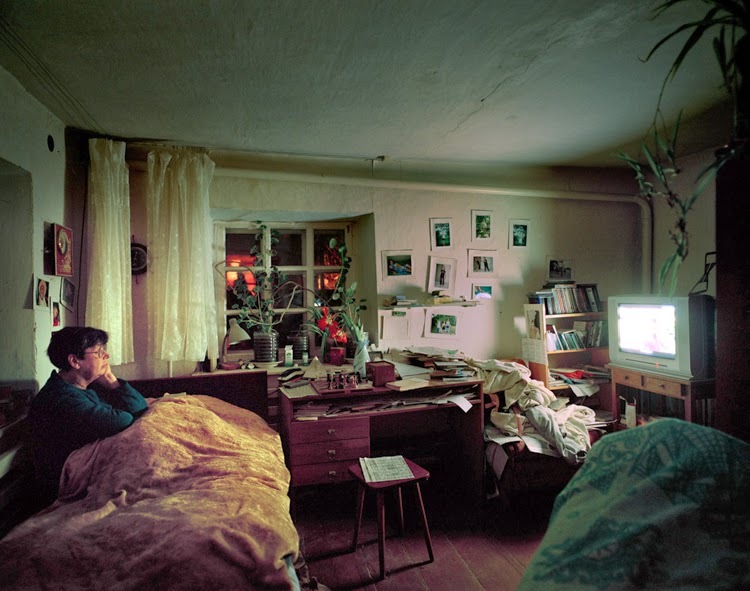 SC: I started off by looking at more limited themes, considering putting images into a typology, or a narrow focus for example on, say, the dacha and close friends, or the intelligentsia etc. There seemed to be quite a bit of pressure to do this - to simplify the subject for the viewer, make it more bite-sized. The more I looked at it, the more I felt that this was not what I wanted to do, that there was more to be said by taking a much wider approach to the subject, seeing the interconnections between all these different picture poems and essays, which seemed to me where things really take off, even if it requires more concentration from the audience. I wanted to do my best to slow the viewer down a bit. In fact, I don't think it has to be difficult for the viewer - because it is possible to dip into the project anywhere and take something out of it (which doesn't necessarily have to be the same as what I might see in it). I don't really expect the viewer to go through the project from beginning to end reading all the texts and looking at all the pictures. It's great if someone dedicated enough does so - but I don't expect it. In terms of structuring it, I kept coming back to these five poems by Yevtushenko that form [Dmitri] Shostakovitch's 13th Babi Yar Symphony. They seemed to give an overview of five different themes that covered an enormous amount of ground - Memory, humour, fear/power, women, and careers/integrity. If this could be done in a symphony, then why not in a photo series? I considered structuring the project around them, but came to the conclusion that they didn't quite fit what I wanted to say. As a foreigner in the post-Soviet period, much as I admire him, I have a different perspective from Yevtushenko. So I took those as a starting point and modified the structure quite a long way from there, taking account of other threads in Russian literature (fortune/Chekhov for example) and my own experience (being a foreigner - the Curious Intimacy of Strangers). On one trip to Ukraine I sat having a "kitchen conversation" with my ex-mother-in-law Larissa, who is a key character in the series, and we were talking about it. She suggested this idea of the "land of endless expectations" and that it clicked with me as it seemed to sum it all up. f: We've talked about some of your literature and music sources and their influence, how about sources from within photography itself? Do you have specific relationships with the work of other photographers, past or present, in your project? SC: The biggest influence is Sylwia Kowalczyk, who apart from being an inspiring photographer - I'm married to her! We discuss everything all the time. But her work is quite different from mine – tends to be mostly studio based portraiture, and her way of seeing things is quite different. 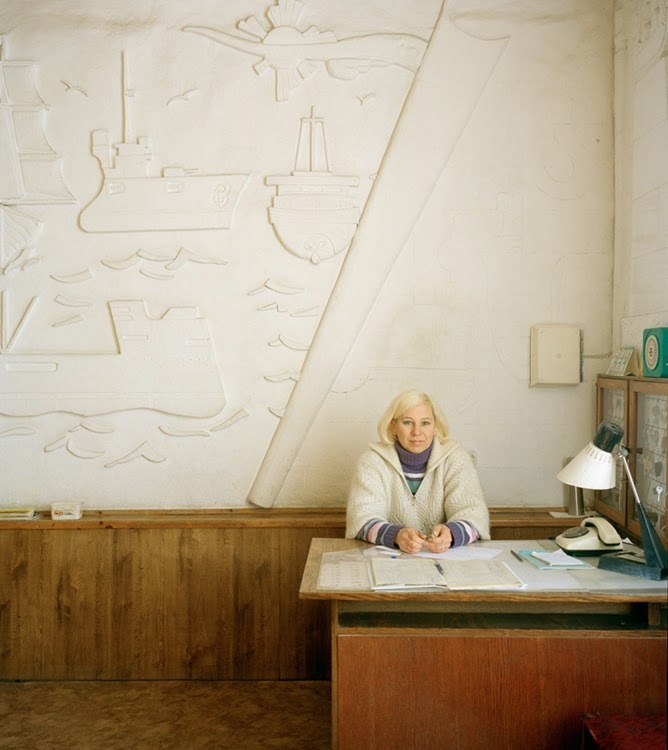 Of course, many photographers have photographed around the former Soviet Union. 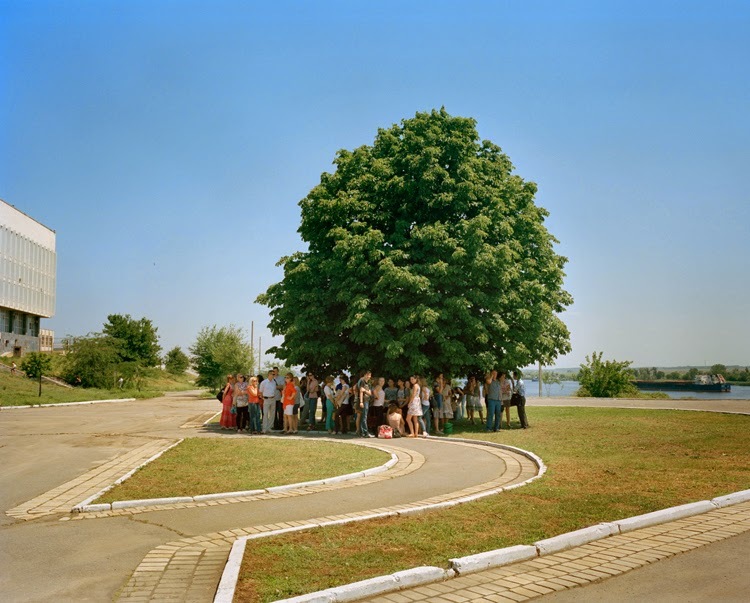 The one I feel most empathy with would be Rafal Milach, who has a close connection to his subject. 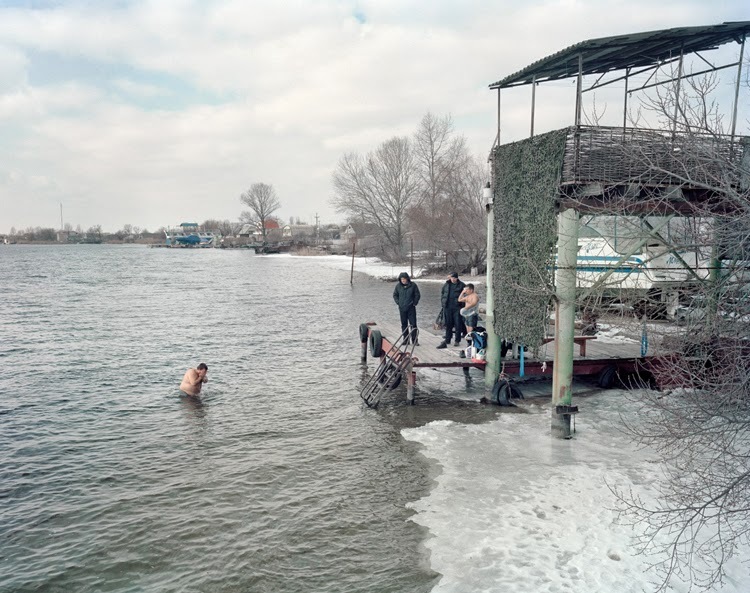 Having lived in Poland with Polish photographer friends for quite a few years, I'm drawn towards photographers from Poland, Czech Republic and other Eastern European countries – Witold Wieteska, Vladimir Birgus, Miro Švolik. 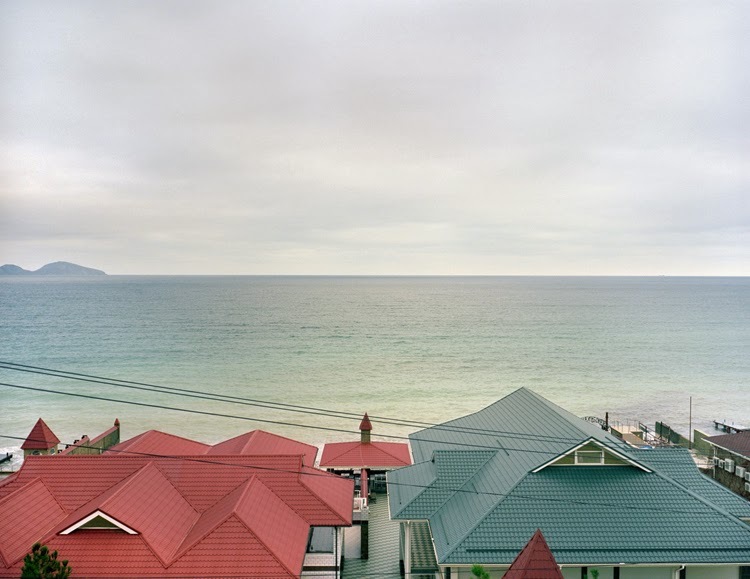 From western photographers I really like the likes of Hannah Starkey and find Greg Crewdson's work fascinating – a lot of the photography I like is not documentary. When I was a kid I had posters of Ben Nicholson and Joan Miro paintings hanging over my bed. I think maybe that might be more visible in my pictures of hotel rooms, but I think there is an undercurrent of it in all my pictures –a kind of desire to strip the a scene back to its elements, tones and weighted shapes distributed around the frame. f: How did you come to the conclusion to work with both text and image and what is your working process for going back and forth between words and photographs? For example, do you write in relation to a group of images? Do you look for images that can work with an existing story? More generally, do you think photography and writing have ways of expressing ideas and exploring themes that are unique and that are not possible in the other medium? Or would have been possible, just not as eloquently or forcefully? It's a way to ask if you believe individual media have limits in terms of what ideas they can express and/or the range of how they can explore ideas. SC: I think you ought to use whatever tools best get across what you want to say, whatever conveys emotion and meaning. I don't see why words shouldn't be used with images, or that there should be any rule that images should stand alone. After all, words work with music – song. I think this combination can be really exciting – both song and a free-flow of consciousness between image and word. 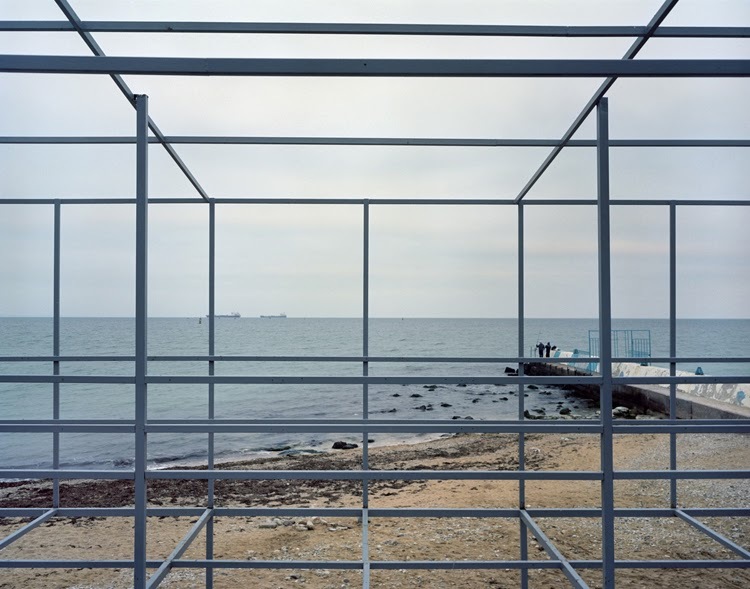 Expectations is really an image series – when I was taking them I kept thinking of the images as being like poems - pictures can have transparency, ambiguity, intuition and emotion, like an [Anna] Akhmatova poem. So I decided to refer to these mini-series as "picture poems." The text here is a context, a series of recollections and thoughts. I don't claim to be a novelist, so the text followed the images – I chose and grouped the images as I would for any photo series – above all visually, bearing in mind the overall themes that I wanted to get across. The text followed naturally from there and was done last. The aim is to set the viewer's mind ticking, to suggest different directions to head off in, and also, I hope, to entertain. I always loved the fact that T.S. Eliot wrote notes to accompany The Wasteland to explain some of the more obscure references. I don't think it detracted from the poem at all. There is a lot of background that it just helps us to know. Russia and Ukraine are extremely complex societies and quite different from Britain for example. If there is something in Dostoyevsky that people really ought to understand to feel the pictures better, then that needs to be set out in text. Sometimes the subject in the image really has something interesting to say, and to stop them saying it would just be selfish, so sometimes the text is just them talking. The website is also a kind of resource pool that people can dip into if they want to, and it frees me up to just show the images I want to without having to get distracted by trying to explain anything. When showing people the images in the past, I was really wanting to explain so much about what was behind them – now I don't have to, I can show the images if I want to without context, and if someone wants to know more, they can go back to the website and understand more. They don't have to, but it's there if they want it. The pictures and text weave their own threads of consciousness independently, sometimes crossing, sometimes even in opposition to one another. The text isn't a literal explanation of the images, and the pictures aren't an illustration of the text. When you read the texts I think the pictures help you to feel that you are dealing with real people, you can look into their eyes and have a conversation with them, you can insert yourself into a situation, and you can see immediately a huge amount of information. But If you are forcing the viewer to come to a particular conclusion then that is propaganda and an insult to the viewer's intelligence. Again, the complexity comes back to Chekhov and the need to feel the possibilities of a situation rather than have everything spelled out. f: On your site's splash page, you’ve laid out the six picture poems with a dashed line moving the viewer along them. You said earlier on that you don't necessarily expect the viewer to go from beginning to end through the entire project, but how important is that sequence for you as the author of the work? How did you develop the sequence of the six in terms of publishing them? SC: The sequence is pretty important, and I spent days chewing it over, because it forms a kind of journey of ideas, a development. The map gives a visitor to the website an idea of where they are in the journey – and also a quick visual concept of what it's all about without even having to read a sentence. But that doesn't mean that they should follow the journey from beginning to end. The thread is a bit like the Silk Route – important to understand where it's coming from, but it's still possible to go to Samarkand on holiday without starting in China! Some of my favourite books, like Barbara Tuchman's The Proud Tower, can be read by dipping in and reading whichever chapter catches your eye. And when you walk into a gallery – you can walk around the space in unpredictable ways, you may not read every caption or statement, and that is part of the charm of galleries – that the behaviour of the viewer determines how they see an exhibition. I will also be publishing the series as a book later in the year, and the sequencing and selection of the images and materials will certainly be different, because it's a different medium. And a gallery presentation would be different again. Having wider background materials on the website should allow me to be more specific and targeted in other media without reproducing all the texts. f: Can you walk us through creating one of the picture poems a little bit? Let’s take "Fortune." What criteria did you use to select the images? How are you thinking about the sequence of images? What kind of elements are you considering as you sequence – mostly formal connections or more towards narrative implications? Why the quote at the beginning? SC: The criteria for selection was above all visual, a matter of visual pacing, while of course keeping in mind the theme. The images in "Fortune" can't literally demonstrate a change of fortune because that would be banal and tell us nothing, so one of the selection criteria was that they should have more to them than the obvious. But of course the narrative sequence is also important. I can't really divorce the narrative elements of an image from its visual properties. So, within the first three images I have a landscape that is closely tied to the first quote, to Chekhov. The quote is there for practical reasons and to create a small link with the essays. Without some context, the viewer might not realise that the first image is of a burial mound that is associated with buried Scythian treasure. 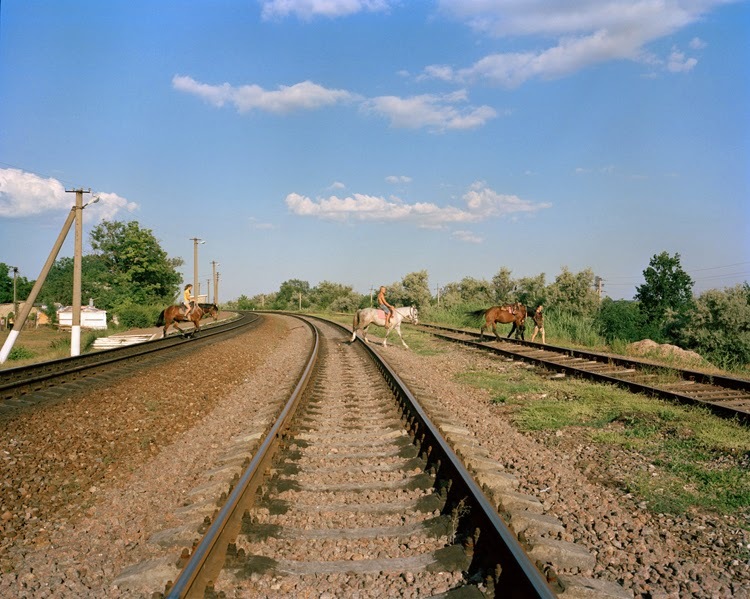 This is the southern Ukrainian landscape where Chekhov grew up and many of his ideas and stories flowed out of his childhood in this landscape. It neatly encapsulates the idea that a change of fortune becomes almost more important than the thing itself. Hopefully it launches the viewer on this path of seeking out connections between images and literature, that the two don't exist in a vacuum. 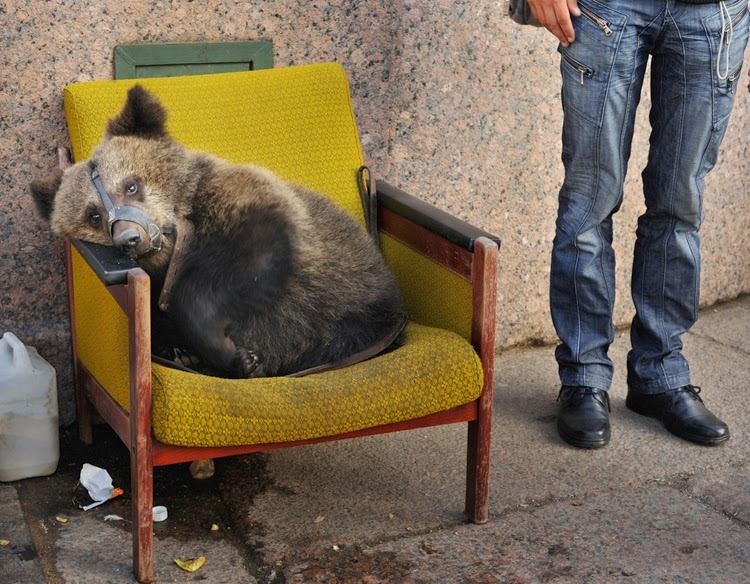 The second image, of the bear, not only has the idea of waiting, of melancholy (there is a special word that combines all of this in Russian - toska), but also introduces animals as a kind of reflection of humans, which pops up regularly in the images. When themes like this pop up, I'm also looking at pacing them through the images, so that hopefully they pop up at appropriate moments in the context of other images they work with visually. I'd probably best stop trying to deconstruct my own images, too much navel-gazing isn't healthy, but that’s the kind of thing that is going through my head when sequencing. The third image, which is of Larissa at home, introduces a character (and place) who is important in the narrative of the poems, and especially in the "Utopia" third picture poem. Even if you don't read the essays, I hope there is a sense of intimacy, of the ascetic life of someone from the intelligentsia, and so on. "Fortune" is the starting point of the journey because it is the most directly and obviously connected to the overall Endless Expectations. Endlessly expecting what? – something to change – like in Beckett's Waiting for Godot. So it provides a context and a start, which can be developed in the other picture poems. Because the text is separate, I don't think the content of each essay has any influence on the sequencing of images, it would be counter-productive if the text started driving the images. I let the text wander far from the images if it's better that way, because I don't want them too roped together. Sometimes I refer to an image a bit in the text with a thumbnail (partly just to make a block of text less intimidating, but also to contextualize it) but these thumbnails aren't in a special sequence, they're just a way encouraging the viewer to pass back and forth between the text and the image galleries.